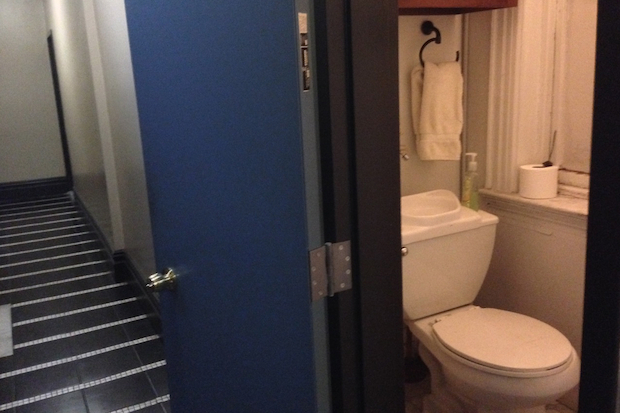 Hallway Toilets, Adult Bunk Beds: How Have You Sacrificed to Afford NYC? What Have You Sacrificed to Afford a New York Apartment? MANHATTAN — What have you sacrificed in your apartment to live in New York City? Some give up sunlight, shiver through winters or have even more dire struggles, doubling up with other families in potentially dangerous conditions. As the de Blasio administration eyes neighborhoods like East New York, western Flushing and the Jerome-Cromwell section in The Bronx for its affordable housing plan, some New Yorkers would rather find creative ways to stay in pricey Manhattan areas. Kento Kawaguchi, an assistant trader at a Japanese bank based in Midtown, for example, wanted to live within walking distance to his job while saving money at the same time. For him, being able to afford Manhattan meant giving up a toilet in his apartment for one in the hallway of his fourth-floor Upper East Side walk-up. "I hate it," Kawaguchi, 35, said of having to exit the one-bedroom he shares with his dog in order to relieve himself in the hallway bathroom, for which only he has the key. "Sometimes if I hear someone is out in the hallway, I have to hold it for a while until that someone is gone." But the sacrifice has been worthwhile, he said. He pays $1,350 a month. That's roughly 60 percent less than the average $3,377 a month for a Manhattan one-bedroom, according to a recent report from Douglas Elliman. It’s also much cheaper than the rents in the fashionable parts of North and Brownstone Brooklyn, where one-bedrooms averaged $2,709 a month and the Northwest parts of Queens, where new development is pushing rents upward to an average of $2,631 a month. Though Kawaguchi often thinks about moving out, the apartment affords him the luxury of walking to work and saving up "comfortably." He's tried to make the best of the bathroom. He's added lights that automatically turn on when entering, along with an iPhone that pipes in music and a fountain that gurgles when someone flushes. The bathroom has even become a litmus test for potential girlfriends, he said. If they think it's "gross," he knows it's not a good match. And roughly once a year, after a night of drinking at a party, he said, "while I get down on my knees puking in the stall, I just whisper to the toilet, 'Thank you for making living in the city possible.'" There's no shortage of New Yorkers who have stories about the unusual living conditions they've endured to make rent. Some make their homes illegally in non-residential buildings, others remain in pest-infested tenements, locking their food away to keep rodents at bay. One Elmhurst resident even posted a Craigslist ad looking for a male roommate (who could weigh no more than 165 pounds) to share a bunk bed for $380 a month. When Kari Espeland moved here from Indianapolis in 2008, she only wanted to be in Manhattan. She spent her first eight months sharing a living room with another woman in a mouse-infested one-bedroom near Columbus Circle. She then spent the next three years in a bunk bed in the East Village, renting out the bottom bed to other women. "There are a lot of people who don't understand how you could share a bedroom with someone else in your 30s," said Espeland, now 37 and living in Denver. "We would never see each other," she said of her bunk mate. "You don't move to New York City so you can hang out in front of the fireplace. The number of evenings I spent home over the four years I lived in New York I could count on one hand." The East Village two-bedroom unit cost $2,250 a month, split by four, when Espeland first moved in. The lease went up to $3,300 a month just two years later, when three women were living there, she noted. "For me it was kind of an all-or-nothing thing," Espeland said. "If you're not going to be in the middle of the city, why be there at all?" Share your stories of New York City living. What apartment choices have you made in order to afford living here?